BPX™ Brazed Plate Heat Exchangers offer the highest level of thermal efficiency and durability in a compact, low cost unit. The corrugated plate design provides very high heat transfer coefficients resulting in a more compact design. The unit’s stainless steel plates are vacuum brazed together to form a durable, integral piece that can withstand high pressure and temperature. 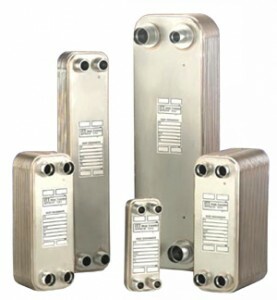 Compared to conventional shell and tube exchangers, the BPX™ Brazed Plate Heat Exchanger offers a more compact design. The BPX™ Heat Exchangers are available in many different model sizes ranging from 1/4” to 4” port size and are ideal for industrial oil cooling, refrigerant evaporators and condensers, and residential and light commercial HVAC hydronic systems. BPX™ Heat Exchangers are available with copper or optional corrosion resistant nickel braze material. Double wall models and ASME code options are also available. Patent Pending BPX™ BPDW Double Wall Brazed Plate Heat Exchangers offer the highest level of leak protection, safety, thermal efficiency, and durability in a compact low cost unit.